The perfect job and finding your soulmate. It’s a romantic idea that many women – and men alike, even if they don’t admit it – cherish in their minds. The thought that one day that 1 in 7 billion people will walk into our lives, or that we will magically find the most fitting job that manifests our life’s purpose. Sorry Cinderella, but life isn’t a fairy tale. And that’s not the way these things work. 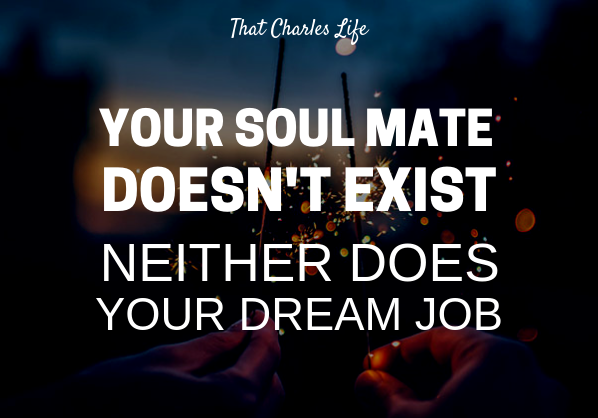 The best medicine tastes the worst; your soul mate doesn’t exist, and neither does your dream job. None of the above will fall into your lap. Expecting these to happen is like betting your retirement on winning the lottery. Both of these ideals need to extinguished, immediately. It’s easy to look at a successful person and think “how lucky they found something they love doing”. Or simple to say to a couple that represents the ideal partnership “I wish I could find the perfect person like you two each have”. Notice the words ‘LUCKY’ and ‘WISH’. These infer that acquiring something we want is out of our control. Hoping for something – that doesn’t exist – to passively happen to us. Now the good news. Neither of these global desires exists for us, but can be created; by us. It can only be done when you move your mindset away from passive hope and inaction, and towards action and manifestation. But first, let’s backtrack a little.. The perfect person doesn’t exist; everyone has flaws. I have to imagine if most people were asked to describe their ideal soulmate, they would lay out so many positive features that would be almost humanly impossible for a single person to boast. Everyone’s got flaws, weaknesses, histories and skeletons in the closet. And that’s okay, it’s the human aspect of us. There’s also a notion that a soulmate is one person. That we just need to find them; they need to stumble upon us. Or us unto them. I’ve been around the world, and built relationships of all lengths with many partners and I’ve felt in love and alive with so many of them. I can’t believe there is one perfect person. It is perhaps a let down to learn the fantasy of ‘the one’ doesn’t exist. But should be uplifting to know there are so many that do exist. I also believe that you may have many soul mates throughout your life. As we live longer, and better for many of those elder years, we will – hopefully – always continue to grow. We may outgrow partners throughout the years and meet new ones. Or perhaps with just one, together, you will grow into many new selves throughout the years. Personally, I don’t believe there is some preset destiny or plan. I trust that we actively create the lives we live and the situations we find ourselves in. Equally, I don’t believe there is the perfect person out there already, but perhaps that we can create that person by our own doings. By how we treat another, and how we treat ourselves. We’ve already covered that when you set to describe your ideal partner, you have high expectations. For example, if I say I want an extremely beautiful woman, that cares for her health, has a great career, strong family values and is loyal and confident. I need to consider what type of expectations that woman is going to have. Pretty damn high as well. So first, we need to become the kind of person that attracts our ideal match. Forget what you’ve heard about being yourself. I’m sure there are many women that hold all of those feats listed above, but unless I’ve built myself to a high level, I certainly won’t attract any of them. Ergo, they won’t be existent in my reality. Commitment is a key word when it comes to relationships. You may have more than one key partner throughout your lifetime. But at each given point in time you should be committed to making that person the right person for you. Supporting them in becoming the your ideal mate. I like to believe when it comes to a partnership, the sum can be greater than parts. Creating an environment to inspire one another will help eachother grow into the type of people you wish each other to become. Your soul mate could be one of many different people. The grass which we water, is the grass which grows. Let’s move on from the pillow talk of soul mates to the next burning passion-heavy desire of a meaningful career or life purpose. Let’s start off with the most basic truth; there is no one perfect job out there waiting for you. Your calling is not going to show up. You were not spit out of your beautiful mother to be only one thing. But again, the good news is that there are probably many things that you can choose for yourself. Positions or careers that will allow you to create lots of impact and make you feel fulfilled. It’s about doing the groundwork to build a passion. My purpose, my purpose, my purpose. As animals, our only purpose is to procreate. Since we’ve arguably become a little bit more than just beasts in the jungle, this ego we’ve developed has us thinking we are here to do more than just hump like rabbits. It is my personal belief our purpose is become the best version of ourselves, to raise others around us up, and to enjoy the human experience. All while avoiding inflicting any damage on others, as much as we can. That’s a pretty broad goal. One that can be accomplished in many, many ways. So you see there’s not really a wrong way to live. There’s no one passion waiting for YOU. Sure, we all have different tastes. And thankfully so. Through this variety, each person can find different interests, dig into them, progress and excel within their chosen domain and then have something to benefit and barter with others through. See, it again comes down to choice and commitment. Choosing something, and committing to stick with it – by putting in the work and reps, getting good and benefiting from it. A life partner, a career, a personal interest; passions don’t exist in a ready-made form. You need to build a passion. You get passionate about something from doing the work and getting good or great at it. Getting good takes time. You’ll go through periods of discomfort, and unenjoyment. Hell, I am having zero fun writing this essay at the moment. I wrote the first half and then it took me awhile to come back and finish this second part. Honestly, what gave me the motivation is that I was complimented a few times on my writing this past week. It reminded me; you need to push push push, even when you don’t feel like it. Now writing is currently not my career but it’s something I’ve come to really enjoy over the years. Maybe one day I will make money from it, too. Currently I am teaching English in China. Teaching English itself, isn’t my passion. But I am beginning to realize I really enjoy passing knowledge to others, and helping them grow. As I think anyone would enjoy. I am building my skills as a teacher, which I can transfer to other disciplines later on. I want to help people become better humans; with their money, by experiencing travel, and by growing physically and mentally. I do that now through my writing. And I suppose I also do this through teaching children English. I’m getting the reps in, doing the work to become someone that knows how to teach people and raise them up. Passion in anything, specifically a career, comes from a long period of building up and getting good at it. Passion is not the reason you start, passion is what you find at the end. It’s the outcome. So go out there and try things. Find something that can create value for others; helping them in some way. Ideally something that you’ll get paid well for. And then stick to it, do the work. Then you will find, passion is the fruit of your labors. The journey of becoming great at something and realizing your passion is also something to be cherished. The growth you will experience, the new knowledge gained, and the consequent confidence you’ll acquire is also part of the reward. Happiness comes by earning it somehow. I think we can all agree passionate people are happy people. Because they’ve earned those feelings. Further to the journey, you may find that the path you’re on isn’t the right one and you switch gears. Don’t get stuck on only one thing being the perfect option for you. Remember, that one perfect thing doesn’t exist. For years I worked in sales, now I’m a teacher. One day I could see myself getting into accounting or finance. Who knows. Always be open to opportunities to better yourself and your situation. Let’s wrap this up. You don’t have a soul mate waiting to be found. But if you are committed to becoming the best YOU possible, and are willing to focus on and attend to helping whoever you choose as a soul mate. You can create your ideal mate. Neither is there a job you can just apply for and be eternally happy. You find passion from cutting your teeth and paying your dues. Ultimately when you find mastery, you will find passion. Finally, don’t get hung up on the idea of one certain job or position. There’s many opportunities that might tickle your chin. Just like there’s many people that could change be that one that changes your life. Very well done, keep writing my man, your ability deserves praise! I honestly feel I married my soul mate forty years ago and also accepted my dream job about the same time. While there was some chance involved I put a lot of thought into both. I interned at the job and saw unlimited opportunity to advance which played out in my going from intern to being the boss of a billion dollar business over time because I had talent and put in the work to develop mastery. I also dated my future wife for a couple of years and we conciously developed shared hobbies like hiking, tennis, fishing and running that we still share now in our sixties. We agreed on important things like faith, kids and frugality because we both knew disagreement on core beliefs and money are relationship land mines. I often tell people I got lucky at marriage and at work but the truth is my wife and I planned a great lifetime marriage and kept working hard at it and I strategized my career well before I decided where to work and then became world class at delivering results. You can’t avoid bad luck sometimes, but you can make your own good luck. Being happy in life is trying to learn to be happy with where you are and what you have. Growing is easier if you’re happy and positive, but it requires that we also strive for more than we have or are. This implies that we marry some system of incremental change to our happy outlook. Keep and reward what works. Learn from and discard what doesn’t. Don’t get too impatient. “We often overestimate what we can do in a year, and underestimate what we can do in ten.” – Bill Gates. Do I get to be the first comment on this post! First off.. I never comment… but this time.. ya! I laughed when I saw the title.. good and edgy.. but I laughed partly because I tell and good story of meeting my wife while traveling internationally and falling for her instantly.. we are still together after 25 years. 2nd.. I’ve had my dream job and career for almost 30 years. I constantly get told how ‘lucky’ I am. Ya right. You do a good job of turning it back around and saying.. the disney version doesn’t exist, but life is what you make it. All good things take work and dedication and commitment. Nothing is perfect.. that’s an illusion.. but amazing is out there, you just have to find the seeds and nurture them and curate the life you want. Bad stuff will happen along the way, its how you react that matters.. good luck with the blog and life!